We are pleased to announce the release of a completely re-designed version of iNeuron. After the success of iNeuron-EFT with over 50,000 downloads, we developed this new version from scratch to provide a more engaging experience on the iPad. It represents 5 years of research and development, input from multiple teacher focus groups, extensive pilot and efficacy studies involving over 1,000 students in 35 classrooms, and an extraordinary partnership effort with neuroscientists, instructional designers and teaching experts at the University of Minnesota. And all of this was made possible by a major, multi-year grant from the National Institute of Mental Health and our generous Kickstarter backers. 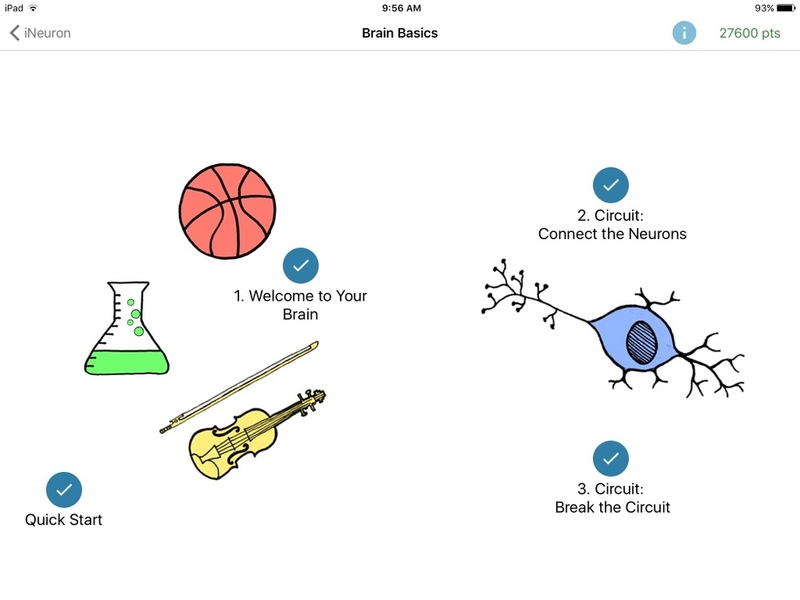 Based on feedback from teachers and students, players are now taken on an exploration of neuroscience with more lessons and more circuit-building challenge games. The distinct new design and revamped layouts have received praise from teachers and students alike. Players choose a role - basketball player, violinist, chemist - and throughout the game learn the relevant neural pathways involved in accomplishing key tasks. The multi-player challenges emerged as the group favorite in our pioneer classrooms. We improved the user interface, expanded the number circuit-building games, and included "Individual Play" and "Group Play" modes at every level. In the original game, the free play section was a favorite destination for many student players, really taking us by surprise. In this new version, we provide additional free play opportunities, with mini-challenges and more pieces and thresholds to tinker with. This version of iNeuron can be downloaded for free, and everybody can play the first two levels in their entirety (including the essential "Neurons & Nerves" and "Flex Biceps"), with full functionality, including group play. Subsequent levels are unlocked with an in-app purchase. For classroom play, teachers will be able to unlock an entire classroom of iNeuron with the Andamio Dashboard for less than $30. It will also give them the ability to customize content, monitor class and individual progress, and generate performance reports. Download and play iNeuron and tell us what you think. Teacher and student feedback is what made iNeuron what it is today.